Semi-finished products such as hot or cold strip are the starting materials for subsequent processing stages and therefore directly determine the quality of the final product. For this reason, metal strip is inspected prior to processing to check that it conforms to certain quality criteria. The most important tolerance criteria is the thickness of the strip. Thickness profile is measured using mechanical and radiometric systems. Micro-Epsilon, a company that produces sensors and systems based in Ortenburg, offers a new alternative solution. 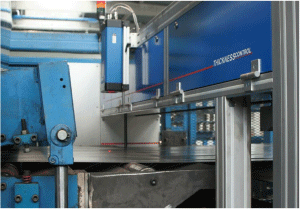 Producing metal strip with a constant thickness is very time-consuming in terms of the technologies involved. In the case of hot or cold rolling, different factors can result in deviations of the target thickness. This also includes the non-flatness of the strip. 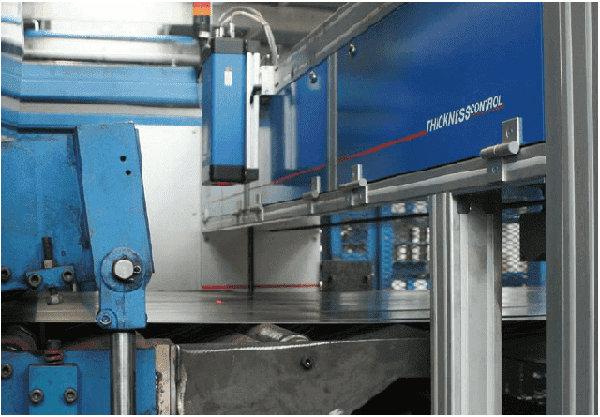 With different mechanical rolling concepts and regulations regarding thickness consistency, the processes within the rolling gap are to be affected in such a way that the stipulated thickness tolerance is adhered to. As a result, subsequent re-rolling of the strip will not be necessary. Even if downstream processes refine the material due to re-rolling of structural changes, the task of thickness monitoring still remains at each stage of the process. This means detecting and documenting the thickness profile in terms of length and width for quality assurance. various measuring points. These values are then interpolated to give what is, however, only approximate information on strip thickness. But this process is far too slow to yield a detailed transverse or longitudinal profile. Indeed, such measurement methods are often affected by operator error, wear, insufficient automation, and they interfere with the production sequence or flow. As an alternative, thickness can be detected using radiometric methods. The radiation from an isotope source is dampened by the sheet. On the opposite side the proportion of radiation that penetrates the sheet is measured. The difference from the transmitted and measured radiation is calculated to a basic-weight value and consequently converted to a thickness value. However, this process largely depends on the alloy and material characteristics of the metal strip and do not offer local resolutions, particularly in the edge areas of the strip. Although such thickness measurements provide sufficient information about the transverse thickness profile, these systems demand complex, costly safety provisions due to the radiation intensity. In addition, radiation protection and constant safety monitoring of three layers if necessary means that high variable costs are associated with these methods. By applying a capacitive sensor, this can be easily solved. The relatively large measuring spot and low offset distance are limitations of these lines. As the sensors measure the total face side, they can only deliver profile information regarding the sensor surface. Particularly in the case of split strip, centre thickness is not sufficient as the thickness must also be detected in the edge areas where the spatial resolution of capacitive sensors is sufficient. The small offset distance requires very close positioning of the sensitive sensors or metal strip, which means there is a risk of collision or damage. An interesting alternative to measuring thickness using radiometric or capacitive methods, is the application of innovative laser optical sensors, of which Micro-Epsilon offers various types. A simple C-frame measurement unit, for example, detects thickness on a selectable track in the direction of production by using two-sided laser displacement sensors. Another solution operates by using a closed O-frame. Here, a traversing displacement sensor is positioned above and below the strip. This means that both sensors are adjusted to one another so as to measure in identical positions.The different measurement tracks are traversed using a motion control system that is adjusted at right angles to the direction of production. For this reason, the thickness profile can be measured over the total width of the product as well as the length profile. The sensors move along the measuring gap via the total band by using the new high precision solution. 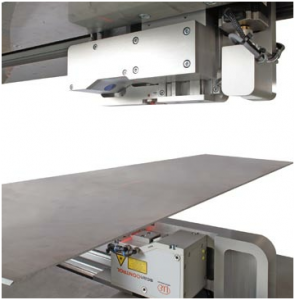 Contrary to the solutions mentioned above, two additional laser line scanners are used, which offer increased accuracy and offset distance to the metal strip. The innovations of the new O-frame models from Micro-Epsilon Messtechnik can be found in many applications, particularly those of adapted laser line scanners for longer distances to the target object and operating safety. With a measuring gap of 200mm, the system tolerates strong fluctuations in strip guiding and is therefore very robust. Simple and appropriate measures such as a design that is open at the bottom ensures a long life in the application. As forging scales and dirt can enter the system, sensors are unaffected. For most applications, operating with a 200mm gap is sufficient. Large deviations of the metal track from the pass line or the bent track ends are always a risk for the sensors installed. Additional mechanical protection ensures that the measuring system is robust enough to withstand any possible collisions with the track. The measuring heads are moved to a parking position and are therefore protected for threading. improved in comparison with the point-type laser. Therefore, 0.01 accuracy is achieved using this system at a maximum bandwidth of 4m. High-tech light barriers support the profile sensors. These profile sensors measure the width and if necessary edge detection of individual strips after they are split. All measurement data is either recorded for documentation as complete thickness profile over the whole strip, or within selectable measurement tracks. These are aligned online to a precise length position on the strip. Strip position is also detected using non-contact methods. Here, the proven ASCOspeed technology is used, which has gained an excellent reputation in many cold strip applications. The ASCOspeed now detects strip speed more reliably than encoders mounted on rollers or separated wheels, which have been used up to now. Slippage and operational wear are avoided due to the non-contact operational method. The current strip length is detected accurately, which creates the basis for the coil production log. A length accuracy of 0.05% allows the data to more easily detect issues, for example, due to inline variations or strip sections that exceed or are less than the target dimensions. 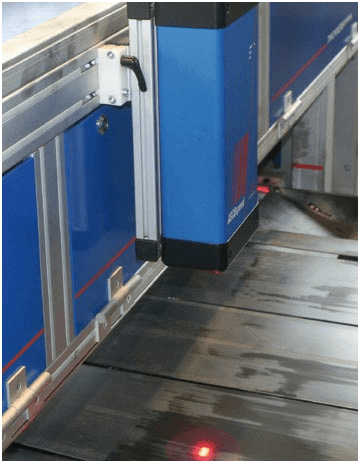 During the integration of profile measurement to a cutting line, all stripes can be measured in width, length and cross profiles. Each stripe obtains a measurement report. Therefore, downstream process steps support quality assurance. The system is used in service centres for incoming goods inspection from the hot strip prior to cold rolling, as well as after the cutting of the coils. Due to its characteristics, the system is regarded as a high end performance system for the geometrical measurement of metal strip. Previous known methods are therefore effectively replaced. 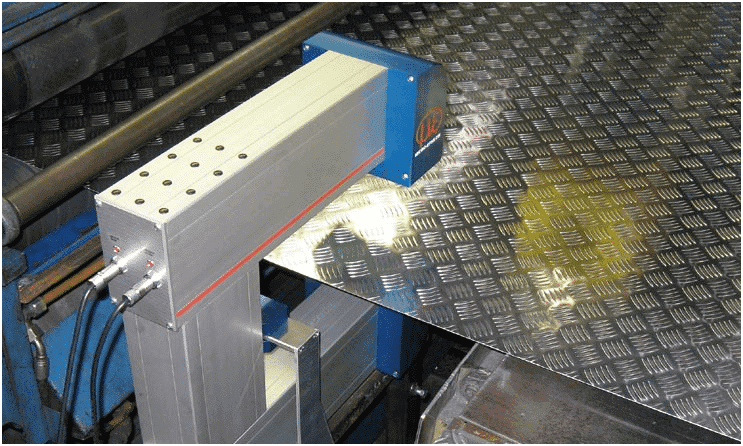 The cost-effectiveness of an investment in a laser scanner measuring system stems from the detailed knowledge gained of the real strip tolerance through to the documentation and traceability of each strip for the final customer. During a measurement, the reflected light of the line is recorded by a highly sensitive CMOS matrix, which produces a precise image of the light section and therefore the surface height profile. Each change of the profile alters the displayed line and therefore generates a changed image on the matrix. As the measurement object or the scanner is usually moved, a 3D image of the object is produced by apposing the individual line profiles. The height profile (x.z-coordinates) is detected by the sensor.